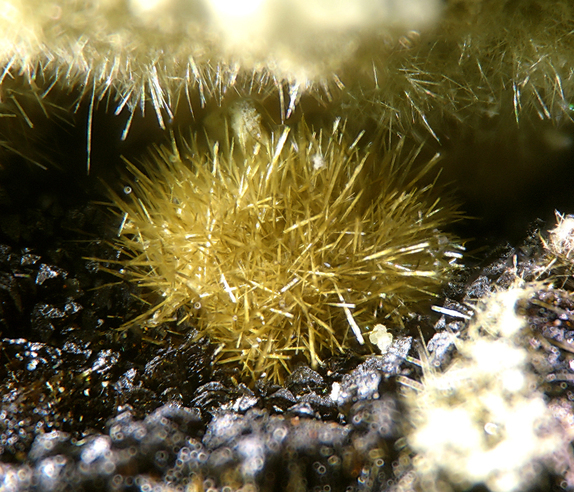 Bendadaite: Mineral information, data and localities. 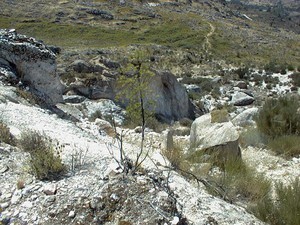 Named after the type locality, the Bendada phosphate pegmatite, Bendada Quarries, Sabugal, Guarda District, Portugal. Arthurite Group. 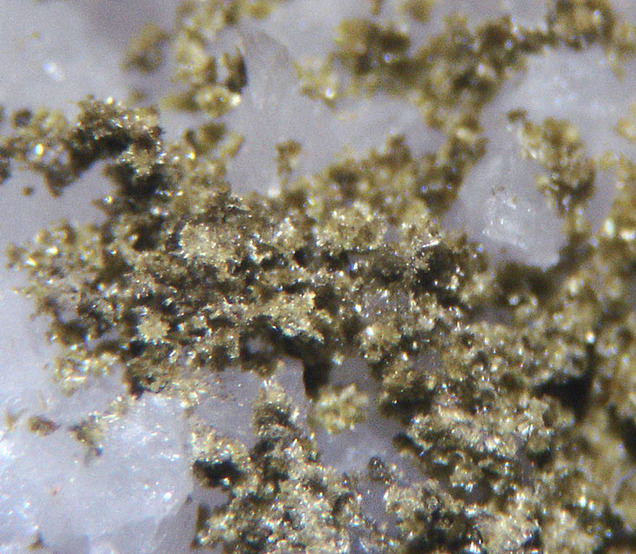 The arsenate analogue of Whitmoreite. The divalent Fe may be partly oxidised. Hydroxylherderite 3 photos of Bendadaite associated with Hydroxylherderite on mindat.org. Goyazite 3 photos of Bendadaite associated with Goyazite on mindat.org. Arsenopyrite 3 photos of Bendadaite associated with Arsenopyrite on mindat.org. Mansfieldite-Scorodite Series 1 photo of Bendadaite associated with Mansfieldite-Scorodite Series on mindat.org. U. Kolitsch, D. Atencio, N. V. Chukanov, N. V. Zubkova, L. A. D. Menezes Filho, J. M. V. Coutinho, W. D. Birch, J. Schlüter, D. Pohl, A. R. Kampf, I. M. Steele, G. Favreau, L. Nasdala, S. Möckel, G. Giester and D. Yu. Pushcharovsky (2010): Bendadaite, a new iron arsenate mineral of the arthurite group. Mineral. Mag. 74, 469-486. U. Kolitsch, D. Atencio, N. V. Chukanov, N. V. Zubkova, L. A. D. Menezes Filho, J. M. V. Coutinho, W. D. Birch, J. Schlüter, D. Pohl, A. R. Kampf, I. M. Steele, G. Favreau, L. Nasdala, S. Möckel, G. Giester and D. Yu. 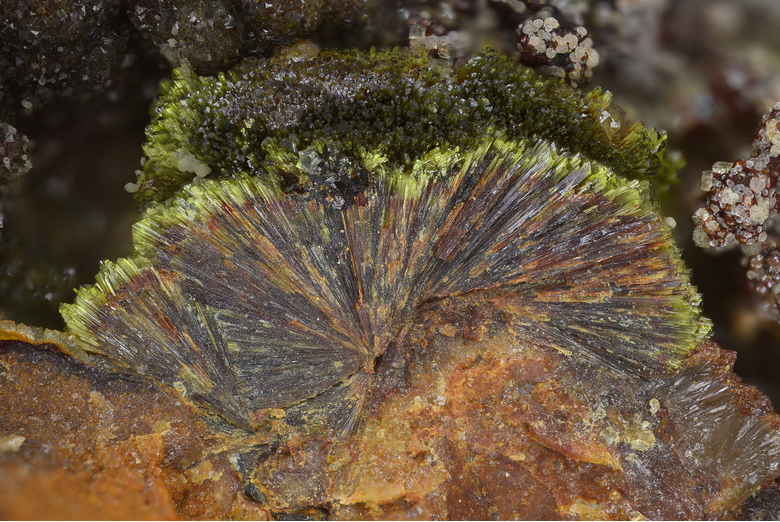 Pushcharovsky (2010): Bendadaite, a new iron arsenate mineral of the arthurite group. Mineralogical Magazine 74, 469-486. Meisser, N. (2010): Sur la présence de bendadaite à la Villatte-Haute (Monts d'Amabazac, Haute-Vienne), Le Règne Minéral, 94, 40. Satoshi Matsubara, Ritsuro Miyawaki, Masako Shigeoka, Hidemasa Tajima, Katsuichi Nishida and Yoshiteru Fujiwara (2009): Bendadaite and iron arsenate minerals from the Kiura mine, Oita Prefecture, Japan. 2009 Annual Meeting of Japan Association of Mineralogical Sciences, Abstracts Volume, Abs. R4-06, p. 100.